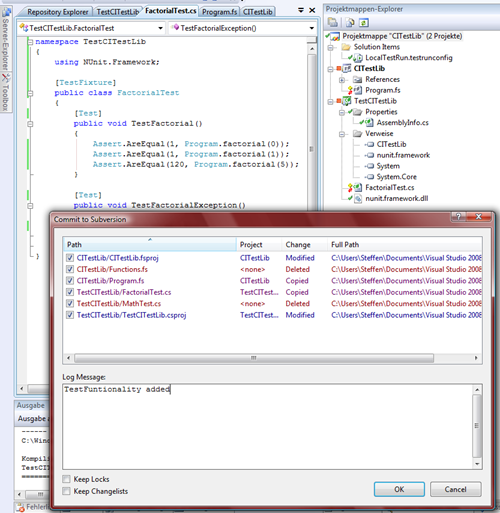 nunit » Tagged "nunit" » Rash thoughts about .NET, C#, F# and Dynamics NAV. 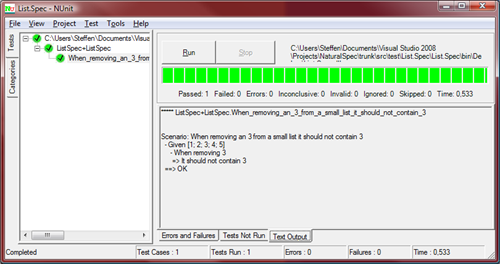 Today Iâ€™m starting a new blog post series about solving code katas in F# and with the help of my NaturalSpec project. A code kata is a programming exercise which helps to improve your skills through practice and repetition. In this series we want to use the Test Driven Development TDD approach which means in the context of NaturalSpec that we have to write our specs before we implement the algorithm. â€œThe game of yahtzee is a simple dice game. Each round, each player rolls five six sided dice. The player may choose to reroll some or all of the dice up to three times (including the original roll). The player then places the roll at a category, such as ones, twos, sixes, pair, two pairs etc. If the roll is compatible with the score, the player gets a score for this roll according to the rules. If the roll is not compatible, the player gets a score of zero for this roll. The kata description gives us some new scenarios. As seen above we should specify them before writing the code. 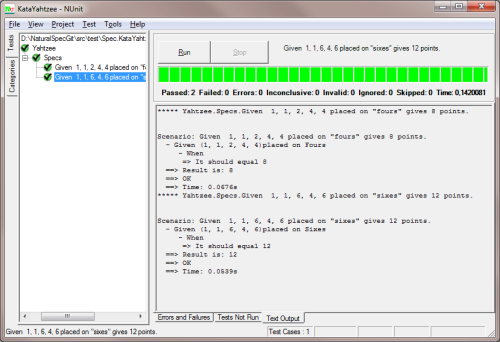 We used a lot of F#â€™s sequence combinators, pattern matching and discriminated unions in this kata. I think this shows that F# is very well suited for such a problem and with NaturalSpec we can easily use a TDD/BDD approach. 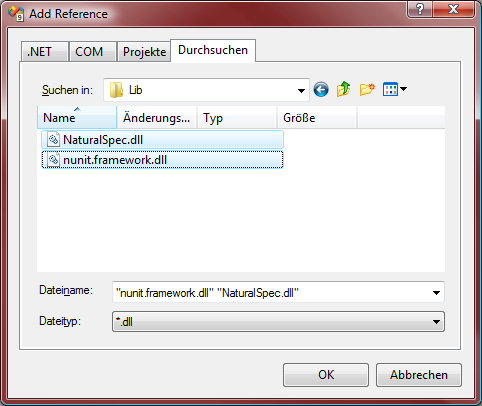 The complete source code can be found in the NaturalSpec repository. If you want to know more about a specific part of the kata or NaturalSpec feel free to contact me. Getting started with “FAKE – F# Make” – Get rid of the noise in your build scripts. I wrote a lot about NaturalSpec in my last articles. This time I will show how we can use parameterized scenarios. 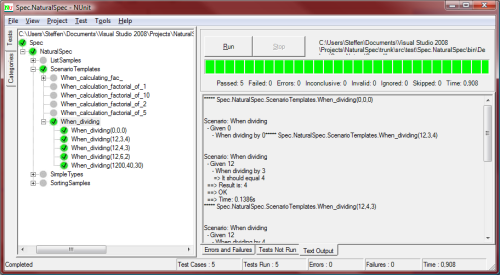 Sometime it makes sense to test a scenario with a bunch of different parameters. We can use the ScenarioTemplate attribute to easily parameterize our scenarios. If we want more flexibility we can use predefined scenarios with custom parameters or the ScenarioSource attribute. Since I am working with hybrid solutions (with F# and C# projects in it) I had to deactivate ReSharper. 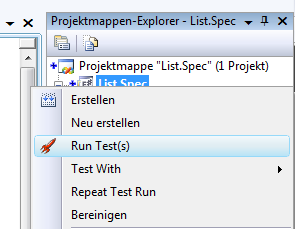 ReSharper had a problem with analyzing my F# sources (see JIRA bug entry #79203). The result was that every single F# defined type and function was marked as an error. I nearly got crazy. On one hand I got used to all the nice ReSharper refactorings (and the NUnit runner) and on the other I got all these false positive errors. But from now on this hard times are over. 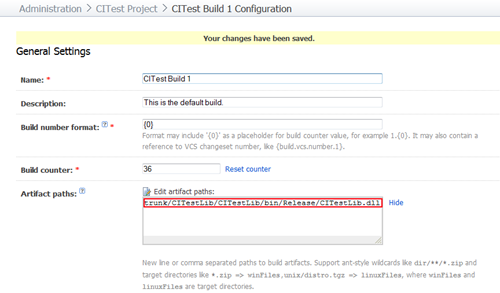 Today I tested build 1153 (see nightly builds for version 4.5) â€“ and everything works fine. In the last two posts I showed how to set up a Subversion (part I: Setting up Source Control) and a TeamCity server (part II: Setting up a Continuous Integration Server). 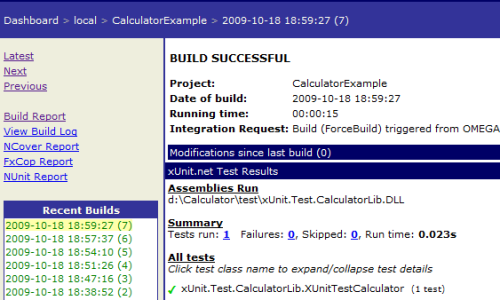 This time I will show how we can integrate NUnit to run automated test at each build. 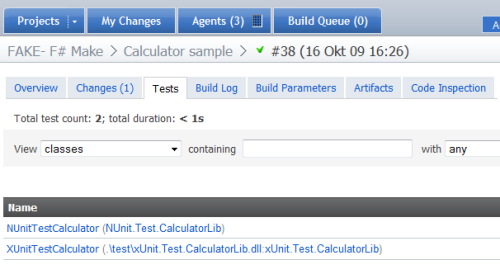 TeamCity supports all major Testing Frameworks (including MS Test) but I will concentrate on NUnit here. "NUnit is a unit-testing framework for all .Net languages. 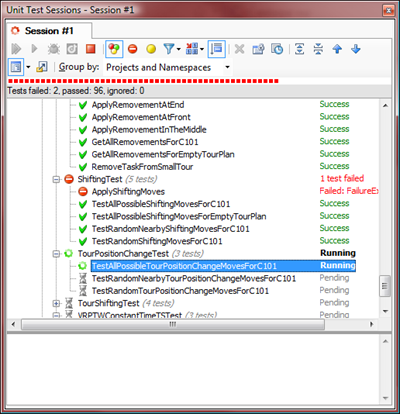 Initially ported from JUnit, the current production release, version 2.4, is the fifth major release of this xUnit based unit testing tool for Microsoft .NET. It is written entirely in C# and has been completely redesigned to take advantage of many .NET language features, for example custom attributes and other reflection related capabilities. 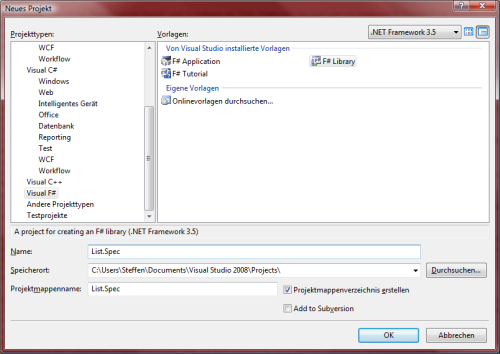 NUnit brings xUnit to all .NET languages." 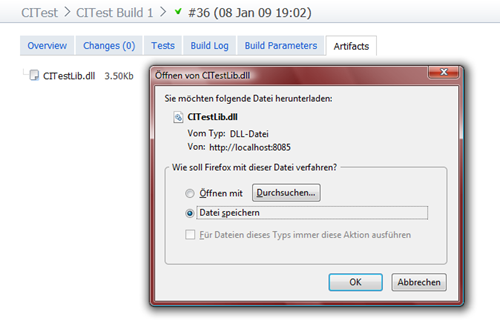 First of all download and install NUnit 2.4.8 (or higher) from http://www.nunit.org/. 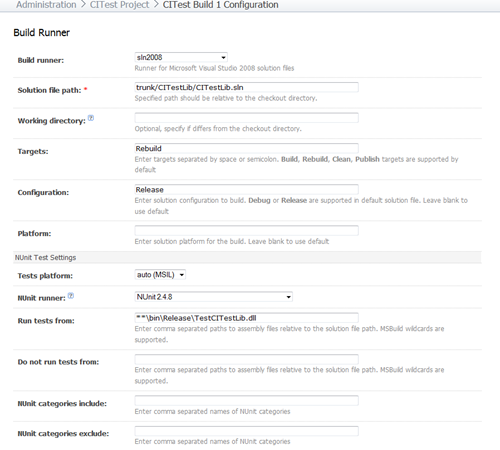 | _ -> invalid_arg "Argument not valid"
To ensure the build runner is able to compile our solution we put the nunit.framework.dll near to our TestProject and commit our changes. Next time I will show how we can add more artifacts â€“ e.g. an automated documentation. Obwohl ja VS 2005 in der Tester Edition Unittesting von Hause aus unterstÃ¼tzt, bleibt fÃ¼r die preiswerteren Editionen (z.B. Professional und Express) immernoch NUnit als Alternative. Dort gibt es jedoch selbst in der Version 2.2.2 noch leichte Komplikationen bei der Installation mit .NET 2.0. Charlie Calvert erklÃ¤rt in seinem Blog ausfÃ¼hrlich, wie man das NUnit-Framework auch unter .NET 2.0 lauffÃ¤hig bekommt.